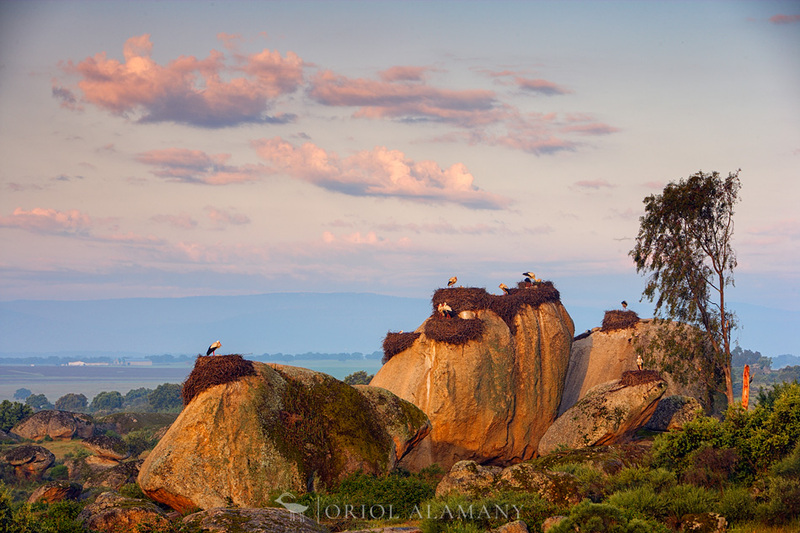 White Stork (Ciconia ciconia) breeding colony over rocks at first light in Monumento Natural Los Barruecos. For some years I have been working on a personal photographic project called “Wild Clouds”, about the esthetic relationship of the wildlife with the clouds in the landscape. Against the tendency to photograph the wildlife by striking close-ups, filling the frame with the subject, for me is important to show the animal as well as the landscape where it develops its daily life. The photograph of an eagle’s face could be made in a zoo, but if the image includes their natural surroundings the doubts about the veracity of the image disappears and we get a true representation of both the creature and its habitat. Making this kind of photographs over the years I realized that if I included in the framing not just part of the landscape, but also the sky and some clouds, the sense of space, of vastness, freedom, grew is magnified. Next June I will show the first public exhibition of this work in L’Esguard Photography Festival in Sabadell (Spain).